Saint Peter’s of Beauvais (Beauvais Cathedral) symbolizes the height of architectural endeavor in Gothic architecture of the Middle Ages. Ambitious and gravity-defying, the cathedral boasts the record for the highest ceiling in a Gothic choir in the Christendom (48.50m). 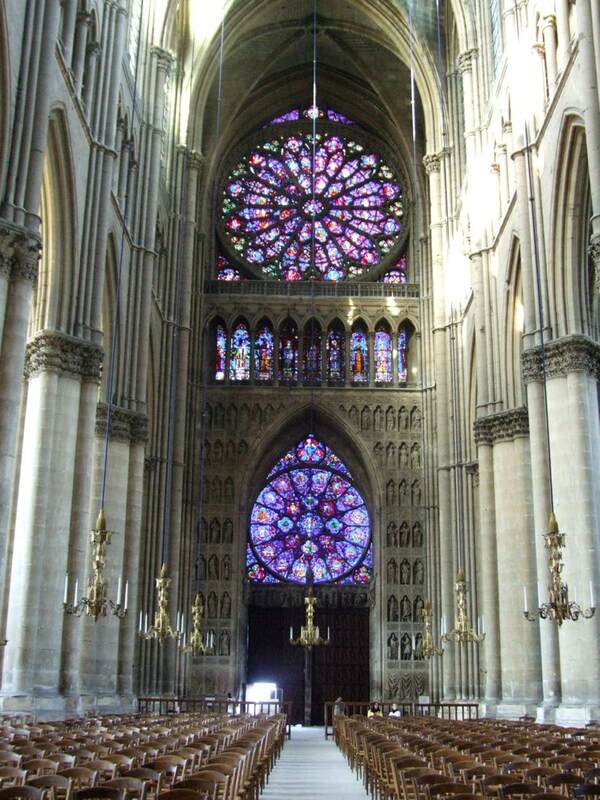 The cathedral also shows the ambition of the builders who were unable to complete it. Starting construction in 1225, the cathedral was meant to be the greatest church in the kingdom but over the centuries construction experienced many problems and structural collapses. What exists today – the choir and the transept – is impressive enough for us to dare to imagine what the finished project would have been. The vault collapsed in 1284 and had to be rebuilt, supported by a dense cluster of flying buttresses. 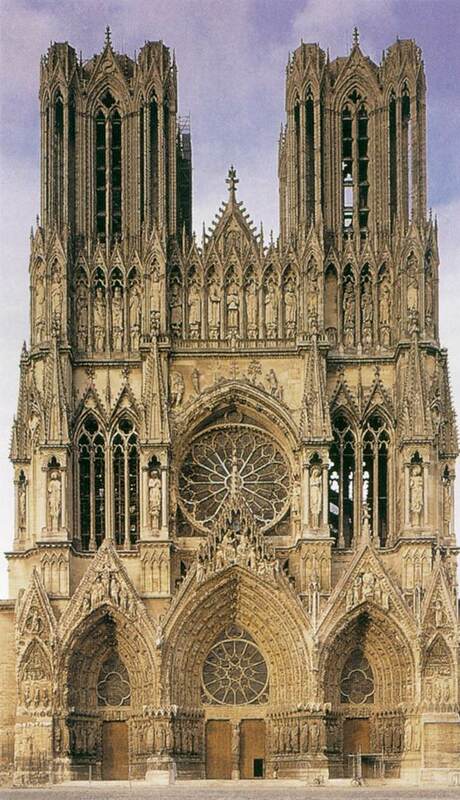 Notre-Dame de Reims (Our Lady of Reims) is the seat of the Archdiocese of Reims, where the kings of France were crowned. 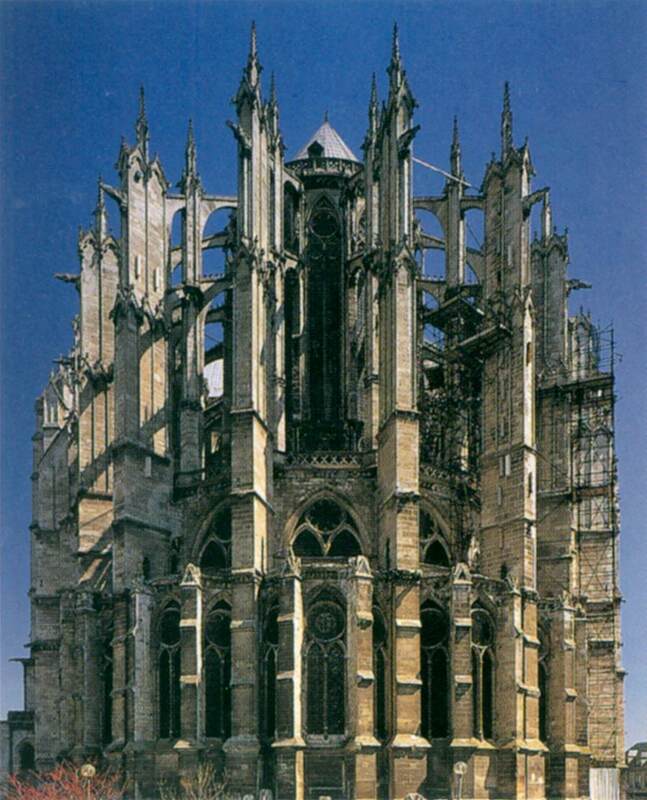 The cathedral replaced an older church, destroyed by fire in 1211, that was built on the site of the basilica where Clovis was baptized by Saint Remi, bishop of Reims, in AD 496. That original structure had itself been erected on the site of some Roman baths. 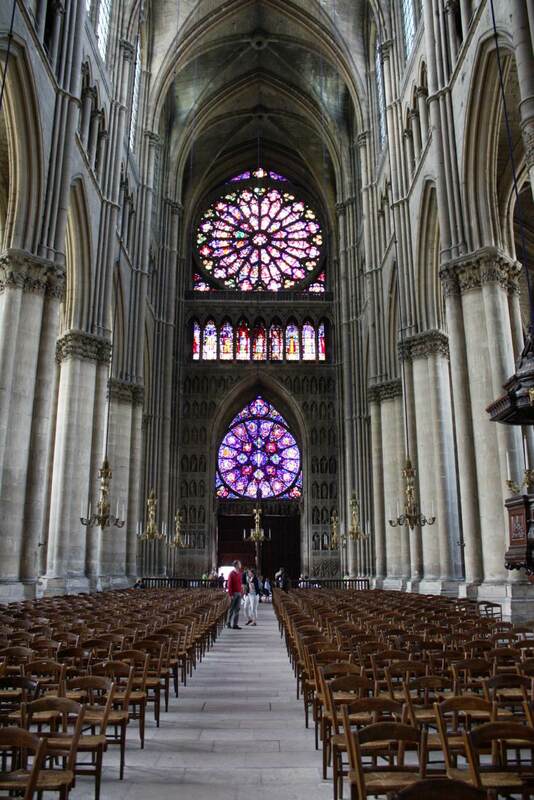 With its Radiant Gothic façade of unequaled dimensions, its interior characterized by soaring vertical heights, the richness of its sculpture and the technical quality of its construction, the Cathedral of Reims remains one of the most beautiful examples of Gothic art. Unusually the names of the cathedral’s original architects are known. A labyrinth built into floor of the nave at the time of construction or shortly after included the names of four master masons (Jean d’Orbais, Jean-Le-Loup, Gaucher de Reims and Bernard de Soissons). The picture shows the west façade of the cathedral. here everything is subordinated to aesthetic unity and upward movement, including window tracery and sculpture. Work on the west façade took place in several phases, which is reflected in the very different styles of some of the sculptures. 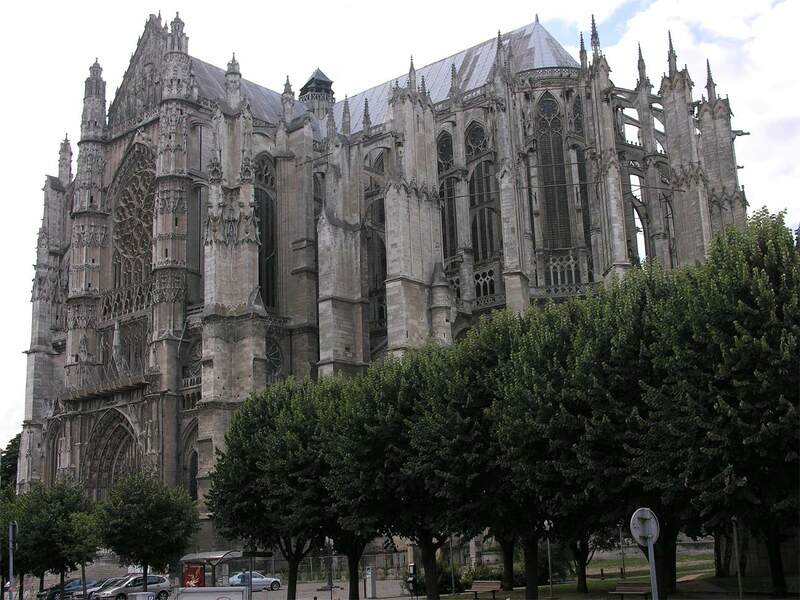 The upper parts of the façade were completed in the 14th century, but apparently following 13th century designs, giving Reims an unusual unity of style. 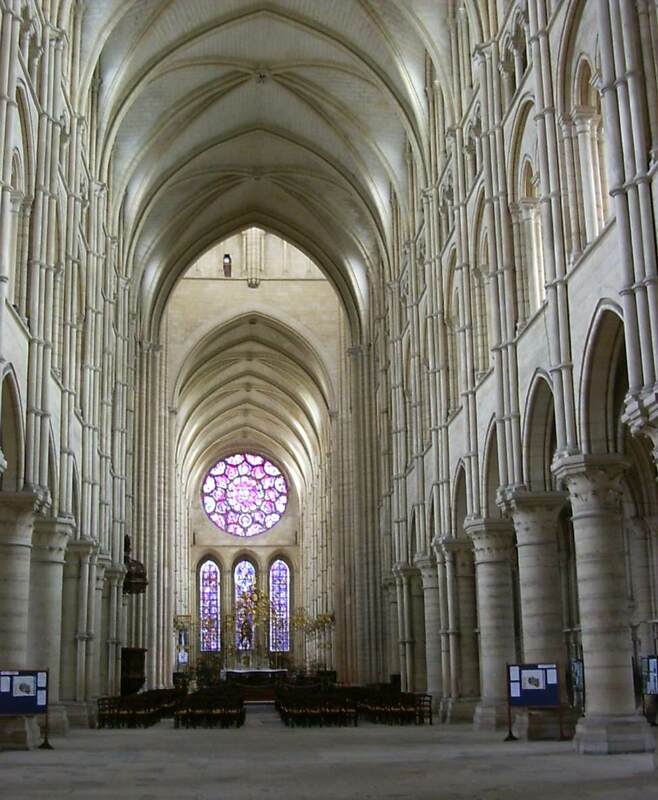 The Cathedral of Laon (Cathédrale Notre-Dame de Laon), in the Picardy region of France, dates from the 12th century. 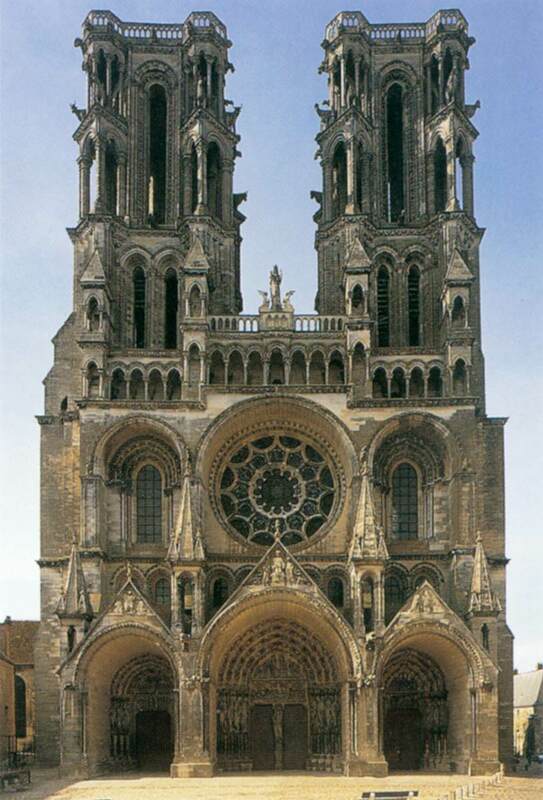 Laon Cathedral is known for its imposing towers, its beautiful Gothic architecture, and its importance as a major stop on the medieval pilgrimage route to Santiago in Spain. Construction on the Cathedral began around 1160, on the site of an ancient basilica that had burned down in 1111 during an insurrection. The new cathedral was completed in 1230. The second half of the 13th century saw the start of work on the side chapels. Considerable reconstruction was done in the early 14th century on the south and north façades. The picture shows the west front of the Cathedral which retains a certain Romanesque solidity and depth. 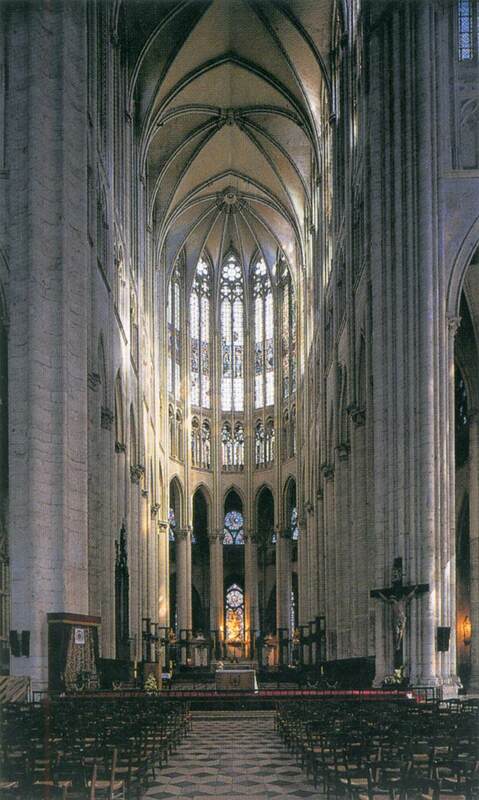 The picture shows the nave in four tiers, with clerestories, triforium and tribune under sexpartite vaulting. 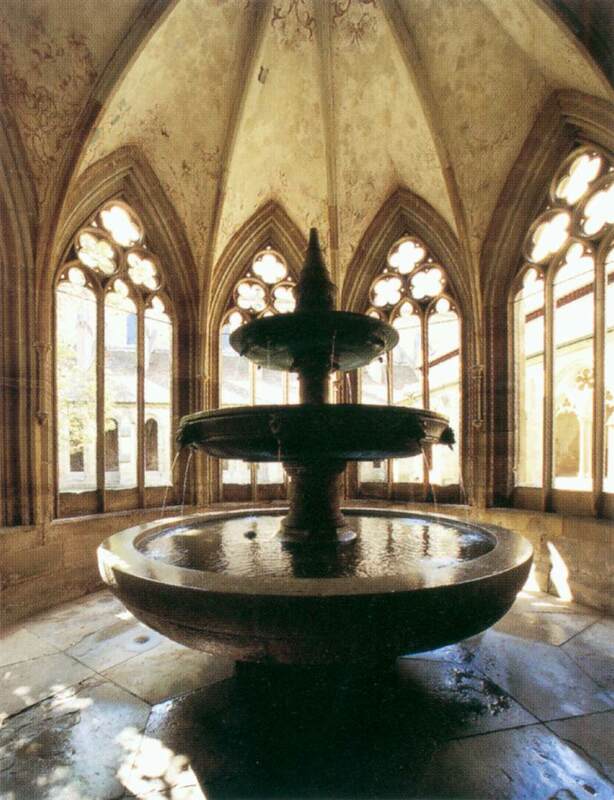 Maulbronn Monastery in Baden-Württemberg is the best-preserved medieval Cistercian monastery complex in Europe. The monastery was founded in 1147 under the auspices of the first Cistercian pope, Eugenius III. The main church, built in a style transitional from Romanesque to Gothic, was consecrated in 1178 by Arnold, Bishop of Speyer. A number of other buildings – infirmary, refectory, cellar, auditorium, porch, south cloister, hall, another refectory, forge, inn, cooperage, mill, and chapel – followed in the course of the 13th century. Outside the refectory stood the ‘lavatorium’ or washing place, a fountain.